Home Additions | Sarnia, Strathroy and Petrolia | Carosyl Home Additions Inc. So...you have a beautiful home in the perfect location, there's just one problem, one big problem - you are running out of room! Before you go on a frantic house search, you should consider a home addition. A home addition can give you the breathing room you need, and you can stay exactly where you are. That means you won't need to leave your preferred school district or say goodbye to your beloved neighborhood. Whether you are looking to expand square footage onto your property or build a second, a home addition can be the solution to your space problems. 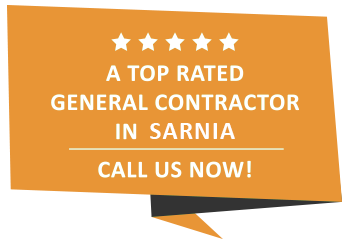 Home Additions with Carosyl Home Additions Inc.
At Carosyl Home Additions Inc., we are a Sarnia general contracting company specializing in home additions. From room additions to floor plan expansions, our goal is to give you the additional living space you need, without going over budget. A home is a major investment. Whether you are a first time buyer or the proud proprietor of a family abode where you raised your children, there is little doubt that becoming a homeowner wasn’t all plain sailing. That is why when you decide to make additions to your home you want to make sure that you choose correctly. At Carosyl Home Additions Inc. we have provided Sarnia homeowners with bespoke, tailor-made home additions for years. We know what it takes to make the new additions to your home as seamless as possible and have the skilled craftsmen to do the job. You would be hard-pressed to find a homeowner anywhere in the Sarnia area who wouldn’t love to have more space in their home. It’s natural to begin to feel cramped as families expand and we accumulate more things. When most people feel this way, they move to a larger house, leaving behind all their memories and experiences in their old home. But this isn’t always necessary! Building a home addition can give you the space you need while allowing you to stay in the home you have developed an emotional attachment to. Home renovation can be an overwhelming prospect; we understand that making changes to your home is always a major undertaking. What we also understand is how to make any home improvement project manageable, efficiently planned and executed while working with your budget. You can get in touch with us any time to set up a consultation with one of our licensed contractors. We'll be happy to come and give you a thorough appraisal of what your costs may look like. During the consultation we can also provide an estimation regarding a timeline for your project, which can help you determine when it's best for you to start the process. We want to make sure that you start and end your days with a smile on your face, and the new kitchen or bathroom of your dreams. Why add on to your home? There are many reasons Sarnia homeowners choose to undertake a home addition project. If you are planning on expanding your family but love the neighbourhood you live in and don't want a change, taking advantage of Carosyl Home Additions Inc.'s home addition services are an excellent alternative to moving. Even if you're not looking to grow your family anytime soon, a home addition could still benefit you. Moving can be stressful, from finding the perfect home to packing up all your belongings and hauling them across town there's a lot of room for things to go wrong. With a home addition however, all of your possessions stay put and Carosyl Home Additions Inc. takes care of everything! A home addition also does not have to mean a new room; Carosyl Home Additions Inc. handles everything from new decks to garages, so if you're looking for a spot to relax outdoors or space for your new car, we can help you out. Start planning your home addition project! When you team up with us, you will benefit from a team that makes your satisfaction a top priority. We realize that any type of renovation project can be disruptive to your schedule, and we strive to minimize disruption through meticulous planning and superior project management. With any project, no matter what the size, the budget is obviously paramount. Even if your budget is more conservative, there is still a lot that can be done, you just have to get creative! Carosyl Home Additions Inc. has experience working on projects of all scales with budgets of all kinds, so if you're curious about how far your money can go we encourage you to get in touch with us. From the very start, our team will be transparent and communicative about any costs associated with your home addition project. As always, your satisfaction is what matters the most to us, and nobody likes to be surprised by the bill when it's all said and done. For a home addition in Sarnia, you need the best! Many homeowners assume that adding rooms to their existing home is a simpler job than building a home from the ground up, but in reality building a home addition can be much more complex than new construction. Between obtaining the proper permits, designing and building the addition to match up smoothly and attractively with the existing structure, and the fact that you will still need to live in your home while work is being done, you need to make sure you are working with a home addition contractor who has the experience to get the job done right. That’s where we come in. Carosyl Home Additions Inc. has been an Sarnia-area general contractor for over 30 years. With an A+ rating from the Better Business Bureau and a long list of satisfied customers, you can trust us to complete your home addition to the highest possible standards. As a small company, we take an immense amount of pride in our work. We will work with you to plan each step of your home addition so that when the work is completed you have exactly what you wanted. For more information about home additions in Sarnia, contact Carosyl Home Additions Inc. today! We know that investing in a new kitchen or an extra bedroom can leave you with a lot to ponder. There are lots of things to consider from style and cost to the building techniques and potential disruption to your family life. At Carosyl Home Additions Inc., we are very serious about what we do. That is why we take these very legitimate considerations on board when commencing all of our projects. The decades of combined experience that we have acquired means we have the skill and knowledge to guarantee that you will receive the best job possible. The kitchen is the heart of the home and should be treated as such. This means that it needs to be taken maintained correctly so as to ensure that it can channel all the positivity into the other arteries of your home. At Carosyl Home Additions Inc. we pride ourselves on creating tailor-made kitchen additions that are customized to fit each home’s individual characteristics and requirements. Not only are our custom-made kitchen additions unique but they are also extremely functional. This style and substance approach allows you and your family to move seamlessly between cooking, eating and relaxing after a hard day at work or school. At Carosyl Home Additions Inc. we know that no two families are the same. It then stands to reason that no two homes the same and, as such, no two reasons for adding an extra room or two to your home will be the same either. For some Sarnia homeowners, space is the primary reason. Your daughter’s bedroom may have been large enough when you bought your home twenty years ago but two decades on and it becomes increasingly difficult for her to find space for the clothes, shoes and other items that she has acquired through the years. At Carosyl Home Additions Inc. we can make measured and tailored adjustments to the dimensions of your room to add additional space or an adjoining room that will easily remedy this situation. For other Sarnia homeowners, a new bedroom addition might be to facilitate an expanding family. The three bedroom house might have sufficed when it was just you and your wife but three kids later and things are starting to get a little cramped. Our skilled craftsmen have the knowledge to add an additional bedroom or two to your home without disrupting its flow. One of the benefits of choosing Carosyl Home Additions Inc. is the size of our team. As a small company, we are uniquely positioned to provide you with home additions that perfectly match your needs. There's no need to worry about communication breakdowns or hard-to-reach contractors, because we dedicate ourselves fully to every home addition project that comes across our desk. If you are in the Sarnia area and are interested in learning more about what we can do, give us a call! We will gladly discuss your needs and schedule an onsite evaluation to determine the best course of action to meet your needs. We look forward to hearing from you! "Our house had already been sold with an agreed closing date of July 12 2012, and the condo that we were planning to move into had just gone through the demolition stage - meaning that we had eight weeks to complete our renovation and move into our condo! That's where Carosyl Home Additions Inc. entered the scene and saved-the-day. After foregoing a social event scheduled for a May evening, Sylvain Dazé met us onsite to review our project requirements..."